« A Cultural Anomaly: Hasids@Harrods? This year’s observance of the Lag B’Omer holiday began on Wednesday evening and continued until sundown on Thursday. Accordingly, the Torah portion from the Book of Leviticus/VaYikra that will be read tomorrow is named Emor and addresses the significance and structure of the seasons of our year. Parashah Emor, meaning ‘speak ‘in Hebrew is one of perceptive contrasts. Although the festivals of the Jewish year are introduced in the book of Exodus, they are reprised in this section of Leviticus to include the laws applying to Kohanim, the priests of Israel. While these laws serve to set the role of the Kohanim apart from the community, they also teach us that even in times of great misfortune and sadness, it is important to retain holiness and joy in life by the regular observance of festivals and holy days. Our calendar is an important means for the understanding and intelligent use of time. It allows us to set aside our daily routines and enter a state of transformation leading to spiritual growth. For example, the search on the eve of Passover to remove traces of bread (chametz) from our homes equates with a search and examination of our own imperfections. Judaism employs a luni-solar calendar in which the year corresponds with the solar calendar and its months match the lunar calendar. Since the twelve months of the Jewish calendar are about eleven days short of a 365-day year, a leap month is added to the calendar on a 19-year cycle. The Hebrew zodiac in the illustration illuminates this concept. The parashah focuses on the observances and performances of good deeds (mitzvot) for the festivals of Passover (Sefirat ha’Omer or Counting of the Omer), Shavuot (Shtei Ha’Lechem or Grain Offering), Rosh HaShanah (Yom Teruah or Blowing of the Shofar), Yom Kippur (Fasting) and Sukkot (Sukkah Booth & Arba Minim or Four Species). In choosing images for this parashah, I’ve focused on the ‘Counting of the Omer’ that occurs during the 49 days between Passover (The Exodus from Egypt) and Shavuot (The Giving of the Law on Mt. Sinai). ‘Omer‘ is the Hebrew word for ‘sheaf’, an offering of grain brought to the Temple in hopes of a healthy barley harvest. For a seven-week period, one ‘omer‘ is set aside and counted on each of the 49 days. This practice commemorates the length of time taken by the Israelites to reach Mt. Sinai from Egypt after the Exodus. According the Zohar, a collection of classic Jewish mystical treatises, this is also a period recognizing their transition from spiritual impurity to becoming a people in a profound relationship with God inaugurated by their receipt of the Law on Shavuot. For those of you who have not seen it, the illustrations for this parashah are adapted from my book Between Heaven & Earth: An Illuminated Torah Commentary (Pomegranate, 2009)* as is the interpretation above. 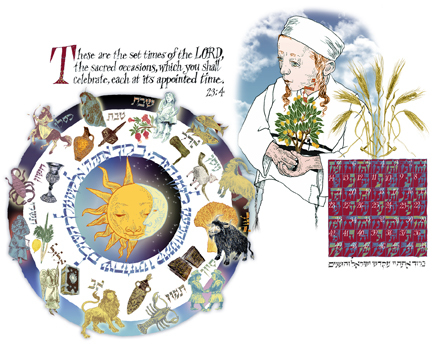 Between the zodiac of the Hebrew year and a grid depicting the counting of the omer with a sprig of barley, the young boy holding a small etrog (citrus) tree reflects a custom among Orthodox Jews that is observed on Lag B’Omer. Until he reaches the age of three, a child is considered unable to interact fully with this world, as he is deeply absorbed in building his spiritual infrastructure. After this time, his family and friends stage an ‘Upshernish‘ or formal haircut celebration to initiate his ‘entry into the world’. If a child’s birthday falls between Passover and Lag B’Omer when hair is not permitted to be cut, the event is postponed until Lag B’Omer. Having attended several of these events, I am always touched by the tender poignance radiating from the child and parent who supports him. The tiny etrog tree and the letter aleph are included here as symbols of the Torah learning and mitzvot that the child will begin to experience. It is heartening to know that we too, can observe this time cognizant of our journey towards fuller spirituality. Hag Sameach! This entry was posted on May 11, 2012 at 7:15 AM and is filed under Imaginarius Updates. You can follow any responses to this entry through the RSS 2.0 feed. You can leave a response, or trackback from your own site.